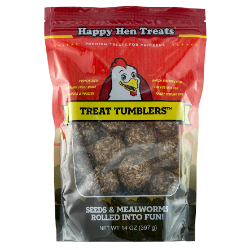 A blend of mealworms and seeds in a ball for chickens! Toss them out and watch them tumble! Your chickens will peck and play with this delicious treat. Protein rich. Easy to feed. Entertaining substitute to regular treats.